Working alongside clients to improve their profitability and minimize their exposures to loss are Ben’s daily goals. Ben was an owner and severed on the Board of Rich & Cartmill, Inc. from 1983-2018. In the community, Ben is also active in and is a Past-President of the Rotary Club if Southside Tulsa and of the Independent Agents of Greater Tulsa. He is active in and has been an Elder in the Kirk of the Hills Evangelical Presbyterian Church. 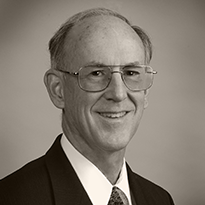 Educationally Ben completed his CPCU degree in 1983 and his CIC in 1990. Kansas University conferred on him the Bachelor of Science in Aerospace Engineering degree in 1970 and the Master of Business Administration degree in 1972. Ben’s work background includes experience in management support positions with Ford Motor Company in Detroit, and Rockwell International and Mid-America Pipeline Co. (MAPCO) in Tulsa before joining Rich & Cartmill, Inc in 1979.